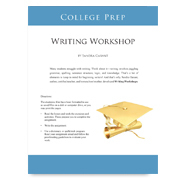 The College Prep Workshop for ages 16 to 18 prepares students to excel in college level writing. Many students who earned A's in high school English are shocked to discover that high school writing will earn a C or D in college. These ten lessons provide a year's worth of practice with analyzing writing, developing a classical argument, writing a college admission essay, researching for documented writing, and giving presentations. Because many colleges strongly recommend courses in American and British literature, a convenient list of poetry, fiction, nonfiction, and drama is included lesson by lesson. As a bonus, students can take advantage of a movie list that incorporates thought-provoking and significant productions, such as Casablanca, Driving Miss Daisy, and Dr. Zhivago.